I was introduced to felt making by my older sister Polly Blakney-Stirling when visiting her in Australia in 1989. I made two pair of slipper/boots and never laughed so hard in my life as we students took turns massaging each other’s feet, to shrink a sack like form to our feet. I have been a professional painting conservator running a business of mixed specialties for preservation of art and historic artifacts, since 1975. Felting has become my pastime and diversion for fun as I move towards retirement. 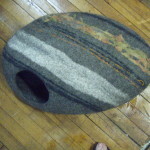 I was a sculpture major in college and have set up a great felting studio in my walk out basement. Robin Blakney Carlson my youngest sister is also a professional felt maker. Both sisters have been my mentors in numerous workshops over the years and in the last ten years or so I have taken many more workshops from other known felt artists to round out my arsenal of techniques as I eventually find time to find a path to my own inspired creations. 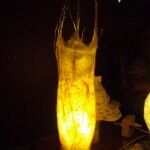 I love felting and the endless possibilities of its creation and use. 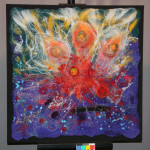 I have loved creating felt landscapes and used to dream of impressionist paintings in felt. I have made many felting friends, learned new techniques and traveled to interesting places to attend guild meetings throughout the North East. 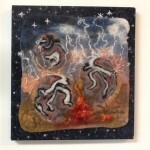 I was excited to display my first felt work in the Guild’s Creation Myth exhibition.